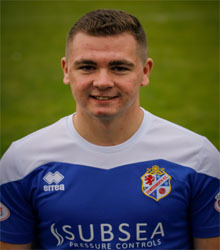 Became the first player born this century to play for the Cowden first team, when he made a scoring debut in the Betfred Cup game with Buckie. Called up in July from Lochgelly Albert Colts after appearing for the under 20 side last season. Still a pupil at Beath HS, he was recently selected for the Scotland Schoolboys U18 side.